Good morning! Happy Friday! Today I used the square Mojo Monday sketch #127 and Color Throwdown #81 (Brown, Pink/White, Olive). I used the JustRite Stitched with Love set. It is one of their new February releases, and I was fortunate enough to win a gift certificate from them. This set was at the top of my list! First I stamped and colored the flower twice, cut one out and popped it on top of the other. The sentiment border reads "I Love Being Your Friend Because... You Always Keep Me in Stitches!". Isn't that sweet?! Thanks so much for stopping by! I hope you have a fabulous weekend! Accessories: Labels Three, Circle and Scalloped Circle Nestabilities (Spellbinders); Circle punch (Marvy), Apron Lace border punch (Fiskars), Diamond Plate embossing folder (Provo Craft), Button (Papertrey Ink), Twine (May Arts), Ribbon, Foam tape, Thread, Sewing machine. OMG...LOVE what you did to the flower!!! Just perfect!! WOW! So pretty! That flower looks amazing! Stephanie, really gorgeous! I love the flower - so clever! The mixed patterns are just wonderfully put together! This is so pretty Stephanie..Love the flower and the stiching around it..Perfect bow :) Have a great weekend !! 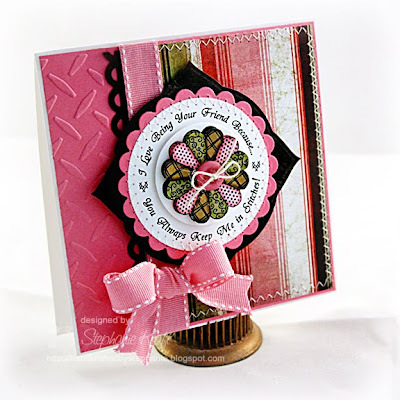 this is a great card-love the bg dsp as well-and your flower is really fab!! Beautifully done! Thank you for playing along with the Color Throwdown. Oh my goodness!! This is stunning and oh so amazing! WOWWWWW!!!! Awesome job..love it! Wow Stephanie - this is stunning. I absolutely adore all the stitching and how lovely your patchwork flower looks with this theme. AWESOME! OOO - Stephanie - this card is very eye-catching! I love the hot pink & black contrast! Simply gorgeous! This is so pretty! Love the popped up flower! Thanks for playing in the Throwdown!